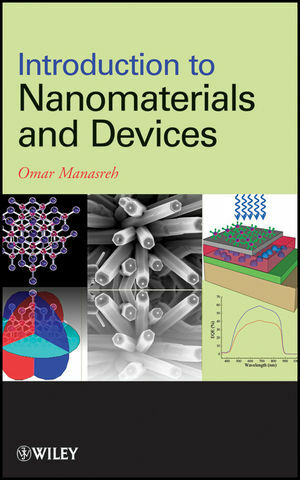 Offering the unique approach of applying traditional physics concepts to explain new phenomena, Introduction to Nanomaterials and Devices provides readers with a solid foundation on the subject of quantum mechanics and introduces the basic concepts of nanomaterials and the devices fabricated from them. Discussion begins with the basis for understanding the basic properties of semiconductors and gradually evolves to cover quantum structures—including single, multiple, and quantum wells—and the properties of nanomaterial systems, such as quantum wires and dots. Introduction to Nanomaterials and Devices provides essential groundwork for understanding the behavior and growth of nanomaterials and is a valuable resource for students and practitioners in a field full of possibilities for innovation and invention. Omar Manasreh, PhD, is a Full Professor of Electrical Engineering at the University of Arkansas. Dr. Manasreh has received several awards, including a Science and Technology Achievement Award presented by the Air Force Materiel Command at Wright-Patterson Air Force Base and the Aubrey E. Harvey Graduate Research Award presented by the University of Arkansas chapter of Sigma Xi. He has published more than 130 papers in technical journals, presented over fifty papers at national and international meetings, and has participated in over sixty invited talks. Dr. Manasreh is a member of the IEEE, American Physical Society, and the Materials Research Society.